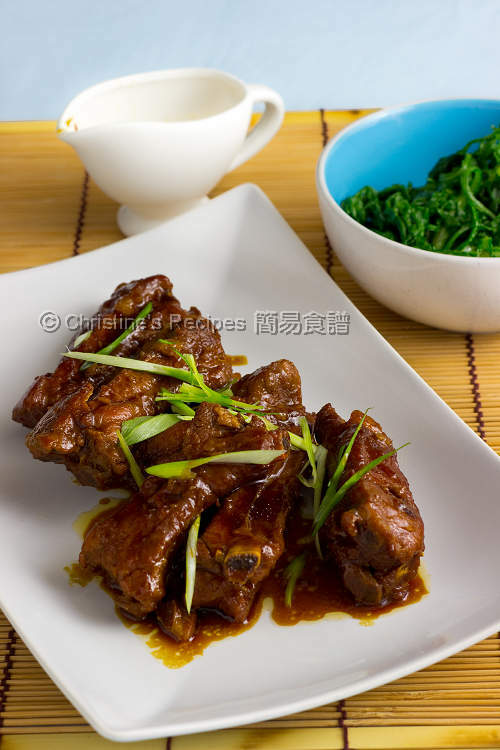 The taste of this braised pork rib dish is quite like the baked one from Chinese BBQ shops. The recipe yields for a secret ingredient though. Does it sound good for those who crave for baked pork ribs but don’t have an oven available for whatever reason? This dish is very easy to make. Simply put all the ingredients in a deep pot or a slow cooker. 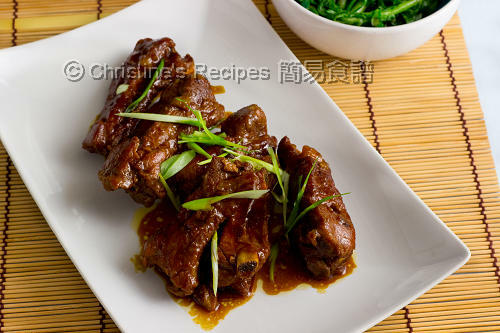 Then you’ll enjoy succulent and juicy rib meat nearly fallen off the bones after a few hours of simmering. The meat is coated with wonderfully tasty sauce. It goes really well with steamed rice. 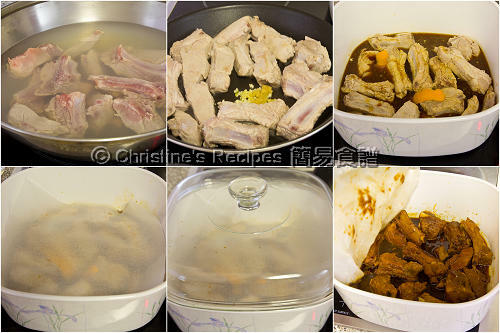 Cut the pork ribs into pieces. Blanch in boiling water to remove blood and any impurities, for about 3 minutes. Drain well. Wipe dry with kitchen papers. Season with salt and pepper. Set aside. Heat oil in a frying pan. Cook the ribs over high-medium heat until lightly brown. Push ribs to the sides of the pan. Add some oil. Saute the ginger and garlic until aromatic. Stir to combine with the ribs well. Transfer into a deep pot or a slow cooker. Pour sauce over the ribs. Place a piece of baking paper on top and cover with a pot lib. Bring it to a boil. Reduce heat to low, and simmer for about 3 hours, or until the ribs are softened, sauce reduced to 1/5 and thickened. Along the way of cooking, occasionally stir the ribs to get them heated evenly. Serve hot with sauce. To place a piece of baking paper on top of the ribs while cooking, it helps to keep the surface of ribs moist and glossy. The secret ingredient to make this tasty dish is Lee Kum Kee’s hoisin sauce and honey. Mirin is a Japanese condiment, available at supermarkets. To get the best results, use heavy based pot or a slow cooker if you have. As the power of every stove and the material of every cooking utensil is very different, the amount of water used will be different too. Top up with some boiling water along the way of cooking if needed. Thanks for the translation. The ribs looks very yummy. I'm very hungry now. Just looking at the picture makes my mouth water. Yum! Thanks for the recipe, will give it a try soon! Just tried this tonight and it turned out great! I didn't have an orange around the house so I skipped it. Also, not sure what American ribs are so I just used baby back ribs. I shortened the cooking time by using a pressure cooker. Everything turned out great. This one is a keeper! Thanks! I love your blog and I have been following it for awhile! I have tried a few of you recipes and I love them all! Will definitely try out this pork recipe this weekend! I'll make this in a slow cooker....thanks for sharing this recipe! hello where can i get your cookbook in australia? Please check this post out and you'd get the links below to order your copy. I made it today and it's so delicious. Thanks for sharing such a wonderful recipe. What are "American" ribs? Baby back ribs or spare ribs? They kind of look like baby back ribs, but I'm not sure. Or does it matter? They are spare ribs. We call them American ribs here. It doesn't matter what kind of ribs you use. It'll work too. Is there any substitute for mirin? Shockingly, I can't find it anywhere around here (Tacoma, WA) even though I know it's a popular ingredient. All I can find is rice wine vinegar, which I know isn't the same thing. Sorry, can't think of anything else to substitute for mirin. You might simply skip it if you can't any. Sure, you can adjust the amount of honey or hoisin sauce. The dish is sweet, yet it shouldn't be too sweet at all. And there should be plenty of sauce left. If the water dries up, the sauce will become too concentrated and too sweet. You might've known that the power of every stove is very different. Taste yourself towards the end of cooking. If you find the sauce is too salty or too sweet, you might top up with some boiling water to dilute it. Where can I get a copy of your cookbook in Toronto? You might like to order it online. Here's a post with detailed info. Can I use pressure cooker on this recipe? As for the cooking time, please refer to the instructions of your manufacturer's manual to make this dish. Hi, i love your receipe. Can I ask what is ginger root? Normal ginger can? Ginger or ginger root are the same thing. Glad to know that. Happy for your success. Is it ok to do step #1 (ie blanching the ribs to remove impurities) the night before, marinate them and put them in the fridge for cooking the next day? Yes, you can. No problem at all. My picky eaters at home liked it. It was tasty and i cooked till meat almost fell of the bone. I always thot of buying a pressure cooker. But not now bcos a basic pot cud just do the job. Glad that your picky eaters loved this dish too. You're so right. Not necessary to buy a pressure cooker. Hi Christine, tried it today & it was a hit at home. The added orange rind makes it so fragrant and eliminate the porky smell. Thanks for sharing! That's the magic of orange rind. Glad that you liked this recipe. Hi Christine, I don't have mirin, can I use white rice vinegar instead? and if I use slow cooker, how long should I cook? Thank you. Mirin is a kind of sweet rice wine used in Japanese cooking. It doesn't have any sour taste, but will make a shiny glaze on the food. If you don't have any, you can replace with a little bit of sugar and wine. hi Christine, if i double the ribs, do i also double the other ingrediants and sauce? thank you. Yes, double the amount of the sauce ingredients. Hi,just wondering if I could cook this dish in Philips High Pressure Cooker? This dish can be made with any pressure cookers for sure. Do you think I can apply the same recipe for beef ribs instead ? Does the same sauce goes well with beef ? Haven't tested this recipe with beef ribs. Guess it works too.